Hollow, reverberant trumpet. Electric grooves. Ambient undertones. Infectious bass. Slippery electronic textures mixed with lithe improvisational flights. 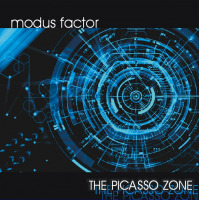 Modus Factor's debut The Picasso Zone is a stellar example of modern jazz's hybrid nature as well as the creative surge coming out of Canada's jazz scene of late. Conceived by drummer Chris Lesso and featuring Brownman Ali on electric trumpet and Ian De Souza on bass and effects, Modus Factor belongs firmly to the Miles Davis electric period branch of jazz. Anything but derivative, however, the trio explores this territory with a forward looking cant, drawing in modern influences to deliver a roiling mélange of funk, fractured beats, trip-hop atmospherics, and unpredictable explosions of ecstatic improvisation. Comprised of ten distinct pieces, Picasso Zone presents a wide range of tunes that manages to establish a consistent thematic space without being repetitive. The standout "Still I Rise" alone would grant the album excellence. A true tour de force, the composition features the politically charged poem by Maya Angelou, read by the author herself. The tune marries Angelou's feminist/civil rights statement with a brilliant arrangement and nuanced musicianship that draws on the author's vocal rhythms and expressive tone to translate the powerful lyric into a modern musical context that creates a poignant challenge fit for our fraught times. Other highlights include the pulsating, effects laden opener, "Brownian Motion"; the multi-layered, temperately paced "Casa Kimono," on which Ali most notably channels Davis; the hypnotic, ambient infused "Rounded Corners"; and the drum and bass oriented "Jagaan." A solid foray into electric jazz that judiciously transverses genres, Modus Factor's debut is as enticing as it is thoughtfully crafted. It brims with energy, even when probing slower tempos, and effectively utilizes an array of electronic effects and astute musicianship to sculpt a distinguished and distinctive sound. A potent beginning that leaves the listener curious for more. Track Listing: Brownian Motion, Now & Zen; Still I Rise (feat. Maya Angelou); Casa Kimono; Afindia; Rounded Corners; King Ghidorah; Jagaan (Awakening); Jeet Kune Flow; Metanoia (Transformation of the Heart). Personnel: Chris Lesso: drums, konnakol; Brownman Ali: electric trumpet; Ian De Souza: electric bass, effects; Santosh Naidu: percussion (4); Andrea Koziol: voice (3).